The Nick Di Maria Quartet will play jazz in the Best Video Performance Space on Wednesday, May 15. The music starts at 8 PM and the cover charge is $5. 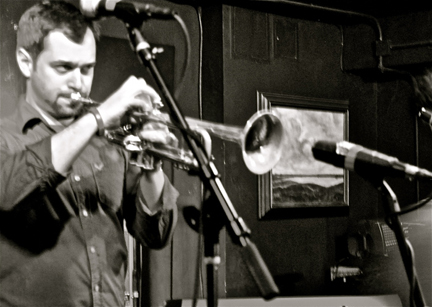 Nick Di Maria is a New Haven, CT based trumpeter, composer and educator. A graduate of Western Connecticut State University, Nick holds a Bachelor’s in Jazz Performance studying under Eddie Henderson, Dave Scott, Jeremy Pelt, Taylor Ho Bynum and Rich Clymer. In 2006 upon graduating from college, Nick assembled his first working quartet. From the beginning the band began working the CT jazz scene playing all over the state, including a residency in Newtown in the summer of 2006. In 2008, after some personnel changes, Nick assembled his current line up. A group that has been working not only CT but NYC as well. The music of Herbie Hancock’s “Mwandishi” group was very influential in the creative sound of this current group. 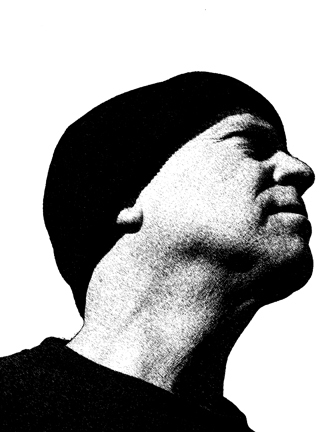 Nick began composing in the style of the band, using electronic and avant garde influences in his writing and sound. The band released their first album in May 2011 entitled “Between You & Me” to positive reviews. 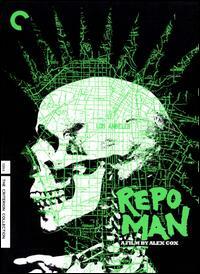 Best Video’s other Hank—Hank Hoffman—here with this week’s recommendation. Hank Paper will return with a new recommendation next week. Film Movement is a distributor of critically acclaimed independent and foreign films—we have dozens of their titles avilable to rent at Best Video. Their selections are, in a sense, curated, chosen for the quality of the storytelling, the persuasiveness of the acting, the commitment to personal vision. KAREN CRIES ON THE BUS hails from Colombia, directed by Gabriel Rojas Vera. But unlike so many films from or about contemporary Colombia, it is not a shoot-em-up about narco-traffickers or guerrillas. Rather, it tells the story of Karen, a Colombian woman who leaves her unfulfilling marriage of ten years to the distant and emotionally abusive—albeit financially successful—Mario. With no jobs, no apparent friends, little money and the disapproval of her mother, she makes her way out into Bogotá, renting a room in a rundown flophouse. Karen is played by Angela Carrizosa with a naturalness that is wholly believable. Her growth into self-sufficiency is spurred in part by her tentative friendship with Patricia, an outgoing beautician who also has a room at the boardinghouse. Feminism is a subtext, of course, but Rojas Vera doesn’t overplay that theme. The strengths of Karen Cries on the Bus are the strengths of the Film Movement offerings overall: telling human scale stories in such a way as to richly accommodate grander visions. 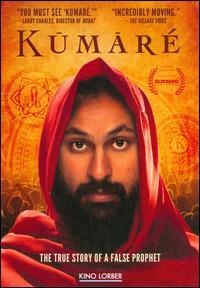 Check out the Film Movement titles in our New Foreign and various country sections. Almost every one is a gem. The performance by jazz trumpeter Nick Di Maria and his quartet, originally scheduled for next Thursday, April 25, has been rescheduled to Wednesday, May 15. 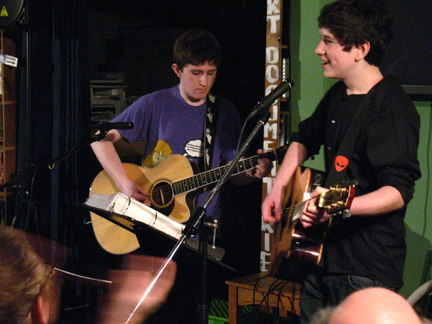 Henry Sidle, right, at Best Video Performance Space in December, 2012, accompanied on guitar by his friend Noah Kesselman. Henry Sidle will perform in the Best Video Performance Space on Wednesday, Apr. 24. The cover charge is $5 and the music starts at 8 PM. Henry Sidle has played the Performance Space twice before—as an opening act for Happy Ending in April of last year and headlining a bill with Anna Ayres-Brown this past December. He will have this night to himself. Henry Sidle, born in Chicago, is a teenage guitar player and singer/songwriter who plays gigs most days of the year. When Henry was 11, he began to play the guitar. Several years later, Henry has made his way to major festivals, venues, studios, cities and private parties. Henry’s music has been played Sirius XM’s Grateful Dead station. Henry has a unique acoustic rock sound, spiced up with his BOSS RC-30 loop station and large repertoire of originals and covers. Henry plays bass in his band Funk You Up. He also plays guitar in the Klezmer band, the Nu Haven Kapelye. He also is a classical pianist and has played recitals in churches. In the summer of 2011, Henry began to work for the Rex Foundation. Henry wrote a song for their World as it Could Be project called “The World as it Could Be” and “There’s a Way.” Both are human awareness songs that have gotten kind words. Green FL Broker said “Henry’s music video is not only beautiful, it is thought-provoking and inspirational to experience a 12 year old’s concerns about the future. I sure wish I could be at the concert to experience Henry’s début into the musical world! I have no doubt Henry will follow his heart and will end up involved in Mother Earth’s well-being as part of his life’s journey.” Henry has played gigs from Jacksonville, FL to New York, NY to Washington D.C. to Montreal, QU. Henry mostly plays locally in his home area of New Haven. Henry plays guitar hours and hours each day. He plays a great deal of open mics when he is not booked for the night. In 2012, Henry won a Neighborhood Music School merit award for his guitar playing. Henry has now played in CT, DC, DE, FL, MA, ME, NH, NY, and RI. Henry’s music has gotten popular on YouTube. His homemade videos have gotten many likes and views. He also broadcasts some sets on USTREAM. Henry continues to play new songs, write new music, work with new people, and find any way he can to perform. DJANGO UNCHAINED — An escaped slave (Jamie Foxx) bonds with an intellectual German white bounty hunter posing as an itinerant dentist (Christoph Waltz) in order to rescue the slave’s wife from the plantation he escaped from. This film is the first to deal unstintingly with the cruelties and indignities of slavery since Steven Spielberg’s AMISTAD, but dare I say the treatment here is different. The style of director Quentin Tarantino’s film derives in part (especially the climactic part) from the testosterone blood-splattering showdown mannerisms of the “spaghetti western” made famous by one of Tarantino’s pulp mentors, Sergio Leone (FISTFUL OF DOLLARS, A FEW DOLLARS MORE, THE GOOD, THE BAD AND THE UGLY). In other words, Tarantino’s film addresses seriously and with a feeling of authenticity the violence of slavery of the anti-bellum South in yet an often non-serious, humorous, albeit stylistically violent way. Some critics and viewers have found this pulp treatment of such a serious subject jarring, even offensive (as they did his pulp treatment of the Holocaust in his prior Academy Award nominated film, THE INGLORIOUS BASTERDS). Spike Lee went out of his way to harshly criticize both Tarantino and his film, tongue-lashing his white colleague’s inappropriately self-taken treatment of an illimitably serious subject that was none of his business in the first place. Others have applauded Tarantino’s daring in offering historically telling details through a stylistically entertaining genre that brings the subject home to a popular mass audience. On the other hand, perhaps it’s just Tarantino being Tarantino, ever on a quest to top himself both thematically and visually, putting his archival film and filmmaking knowledge in the service of his audacity. Interestingly, Mrs. Video shied away from seeing this violent movie but wound up really liking it; just as many women have come up to me at the store to tell me how much they liked The Inglorious Basterds. The film does offer historical information made vividly fresh in a good, well-produced story laden with surprises and many Oscar-nominated (and winning) performances. Unmentioned in all the Academy Awards hullabaloo are particularly impressive performances by Leonardo DiCaprio as the glibly menacing wealthy plantation owner and Samuel Jackson as the owner’s servile but deviously self-serving black task master. The film does go on too long (as many films do these days), ending not where the dramatic arc demands but continuing on through a long, blood-splattering coda in order, I suspect, to have the Jamie Foxx character prevail as the hero instead of his white Kemo Sabe dentist bounty hunter. But all carping aside, the film is one to reckon with: to contemplate and even argue about. Spike Lee admitted he never actually saw the film. You should. The “What Would You Do: Ethical Dilemmas in Great Films” film series is a collaborative effort of Temple Beth Sholom and Best Video. Best Video owner Hank Paper and Temple Beth Sholom Rabbi Benjamin Scolnic will take turns introducing films and leading the post-film discussions. The admission cost per film is $5 and reservations are ABSOLUTELY ESSENTIAL. Most of the previous screenings have been sold out. Seats are still available for this upcoming show. On Monday, Apr. 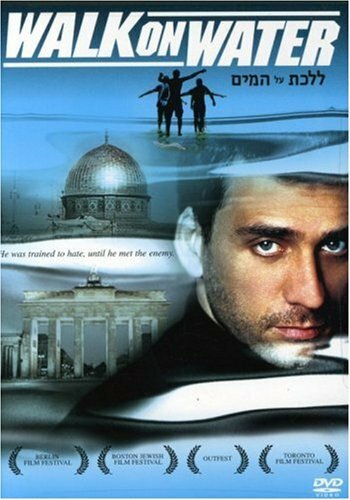 22, at 7 PM, we present the 2004 Israeli film “Walk on Water.” The film will be introduced and the discussion led by Rabbi Scolnic. This is the final film in this highly successful first film series at Best Video. The director Eytan Fox had an unexpected international success in 2002 with “Yossi and Jagger,” a gay love story set against the unlikely backdrop of the Israel Defense Forces. With “Walk on Water,” his third feature-length film, Mr. Fox takes on the even more controversial subject of Israeli nationalism in the aftermath of the Holocaust. In fact, there isn’t much that “Walk on Water” doesn’t take on, from global terrorism and Israeli-Palestinian relations to homophobia in the Mossad, the Israeli security service. 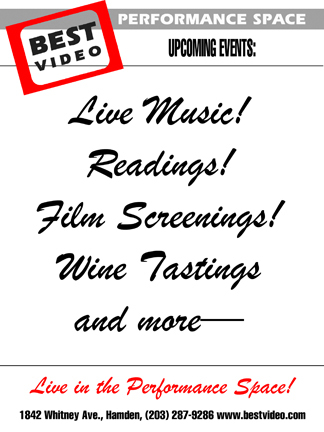 Filed Under: Performance Space Events Tagged With: April 2013, Best Video Performance Space, drama, film screening, Hank Paper, Rabbi Benjamin Scolnic, Walk on Water, What Would You Do? Singer-songwriter Esther Golton, a recent transplant to Connecticut from distant Alaska, will perform in the Best Video Performance Space on Wednesday, Apr. 17. The cover charge is $5 and the music starts at 8 PM. Esther Golton creates music that satisfies the quest for something delightfully different and diverse. 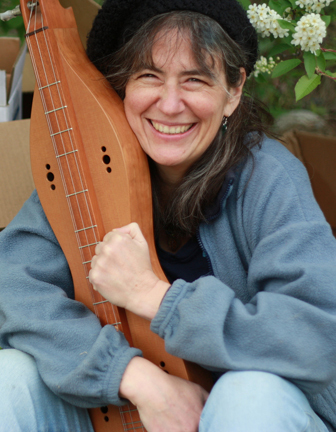 Her voice has been described as “silky smooth, precise and winsome.” Add an unusually intricate use of the mountain dulcimer, stunningly fluid flute, and melodic, colorful writing, and you begin to turn heads.